UK houseboats come in several forms; craft that can negotiate oceans, coastal waters, rivers and of course the traditional canal network narrowboats or, as they are sometimes called, canal boats. This article concentrates on the charming and gentle way of life that you can experience living on narrowboats. 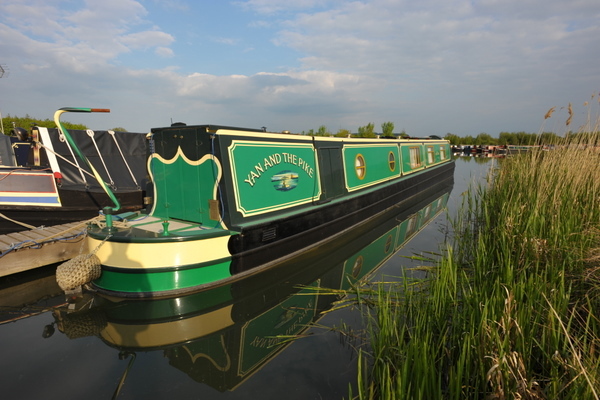 Narrowboats have earned their name because they are just that… narrow. The canal system in the UK was developed at the height of the industrial revolution. To keep costs as low as possible, the new waterways were reduced to the minimum practical dimensions. The canals just allowed two boats to pass in opposite directions. The locks – the increases and decreases in gradient along the route – were often built just over seven feet wide which meant that the maximum practical width for the boats passing through them was, and still is, just 6′ 10″. An average adult can lay with feet touching one side and hands touching the other. Today there are very few working boats on the canal system. It’s now usually cheaper and far faster to transport goods by road. However, there are now more narrowboats using the canal network for leisure than there ever where for commercial purposes. An increasing number of narrowboat owners are now living on their boats full time. I am one of them. My narrowboat, James, is a very comfortable compact home. At 62′, James is a good length for a houseboat. James is a traditional design which means that nearly all of the length is under cover. The entrance is via a stern hatch directly into the engine room. A door leads to the aft cabin (my bedroom) with a fixed double bed. Next is the small bathroom, followed by a further bedroom/study. Next is a small lobby where I store my wine and where I can access the narrowboat’s exterior via hatches either side. Finally there is the kitchen and living area. Life on my UK houseboat is a joy. I can do just about everything you can do in your house but probably not quite as quickly or easily. But the location more than makes up for that and, if I get fed up with the view, I can always move my house! The day begins at 06:15. I have a routine. Because my gas kettle takes a while to boil, I fill the kettle, turn on the gas and jump in the shower. Actually it’s a 4′ long shallow bath with a shower attachment but it does the job. By the time I’ve showered, dried myself and dressed, the kettle has boiled. At this time of year, I don’t have to worry too much about overnight and early morning heating. In the winter I have to make sure that my coal stove lasts the night and is rekindled first thing in the morning. In late April with fairly mild nights and warm days, I can get away with turning on the electric fire for an hour while I have breakfast and prepare for work. After breakfast, I empty the ash from the stove if it’s been used, say hello to the ducks, geese and swans outside the boat. I’m off to work at 08:00 but I don’t have to worry about commuting. I work in the marina where I moor so it’s a three minute walk through woodland to start the day. My lunch break is for half an hour at 13:00. I come home for a sandwich, cup of coffee and a quick read of my book laying on the narrowboat roof in the sunshine then another three minute commute for the afternoon session. Work finishes at 17:30. At 17:33 after a grueling commute I’m back at home for the evening. It’s back on the roof for another coffee and more reading before my domestic chores begin while there’s still some warmth in the sun. I must remember to make my daily checks; gas, electricity, water, kindling and coal. All can run out. Some can’t be replenished until the following day if I run out after the shops have closed. There’s a gauge in my living area to indicate the level of water in my tank. I can top up my tank anytime but I like to do it in the light (and when it’s not raining). Gas isn’t really a problem. I have one cylinder in use and always keep a full one spare. Electricity isn’t too bad either. I’m plugged into a meter controlled mains supply. I top it up by inserting a pre payment card available at the marina shop. If I run out of electricity my lights will still work because they are powered by the boat batteries. Their charge will last until I can get to the shop. Coal and kindling is more of a problem. On a cold winter’s night, there’s no finer feeling than sitting in front of a roaring stove. Coal is very difficult to light though so if I don’t have kindling or fire lighters, I can forget the fire. I won’t die if I run out of coal. I still have my little electric fire. The electric fire doesn’t work off the batteries though so if I run out of coal AND electricity it’s very cold in the boat. I just have to go to bed early. There’s one other check I have to make – the toilet. There are two narrowboat toilet systems; one has a large waste holding tank which can last for two to three weeks. The other is commonly known as a Portapotti. A Portapotti is actually a brand name and is a type of cassette toilet. It has a small removable waste box directly under the toilet bowl. It must be carried off the boat and emptied at a disposal point every four to five days. I have a Porta Potti. The waste disposal disgusted me at first but the toilet waste cassette is very well sealed so there’s little smell and no mess. It’s a small price to pay for living on board. After my chores I have my evening meal. The boat’s kitchen is as well equipped as any dry land home so I can cook what I like. At this time of the year though it’s usually a salad, some fruit and a glass or two of red wine. After dinner, I sit down at my laptop for an hour or two’s browsing or work on my web site. Connecting to the internet is quite straight forward but requires a little exercise. I connect via a USB dongle. The signal within the boat is poor so I have to feed the lead through a window then climb onto the roof to pull it to the highest point on the boat. When it’s there I can surf and download at speeds that don’t frustrate me too much. To rest my eyes, I just have to look up from my work, look out of the window and watch the wildlife on the marina. Tonight, the geese seem to have upset one of the swans. He’s chasing them across the water. They are faster than him but he has them worried. At 22:30 I finish browsing, turn off my laptop, climb onto the roof to retrieve my dongle, and read for half an hour before bed. I don’t watch television. I can’t. I don’t have one. There are plenty of narrowboats on the marina with televisions but they use long aerials to ensure that they receive a reasonable signal. I don’t want the expense or the unsightly aerial and I’m really quite happy with my books. After a hard day’s work, a glass or two of wine, the gentle rocking of the boat, the sound of the wind or the rain on the windows and the sound of the wildlife, getting to sleep is no problem nor is staying asleep before another gentle day tomorrow.